A new research suggested that molecules brought to Earth in meteor showers could potentially be converted into the building blocks of DNA, according to a Science Daily report. Researchers from the University of York found that amino nitriles, the molecular precursors to amino acids, were able to use molecules present in interstellar ice to trigger the formation of DNA, also known as deoxyribonucleic acid. The study was published in Chemical Communications. “The origin of important biological molecules is one of the key fundamental questions in science. The molecules that form the building blocks of DNA had to come from somewhere; either they were present on Earth when it formed or they came from space, hitting Earth in meteor shower,” said Dr. Paul Clarke, senior author of the study from the University of York’s Department of Chemistry. In addition, he said that scientists had already shown that there were particular molecules present in space that came to Earth in an ice comet. This is what drove him and his team to investigate whether they could be used to make one of the building blocks of DNA. “If this was possible, then it could mean that a building block of DNA was present before amino acids,” he said. The researchers explained that in order for cellular life to emerge and then evolve on earth, the fundamental building blocks of life is needed to be synthesized from appropriate starting materials, a process sometimes called as chemical evolution. They showed that amino nitriles could have been the catalyst for bringing together the interstellar molecules — formaldehyde, acetaldehyde, glycolaldehyde — before life on Earth began. When these molecules are combined, they produce carbohydrates, such as the building blocks of DNA called 2-deoxy-D-ribose. “We have demonstrated that the interstellar building blocks formaldehyde, acetaldehyde, and glycolaldehyde can be converted in “one-pot” to biologically relevant carbohydrates — the ingredients for life,” Clarke said. He added that their research therefore outlined a plausible mechanism by which molecules present in interstellar space that were brought to earth by meteorite strikes could potentially be converted into 2-deoxy-D-ribose, which is a molecule vital for all living systems. For many years, it has been assumed that amino acids were present on Earth before DNA and may have been one of the building blocks of the acid, but this research presented new doubt to this theory. 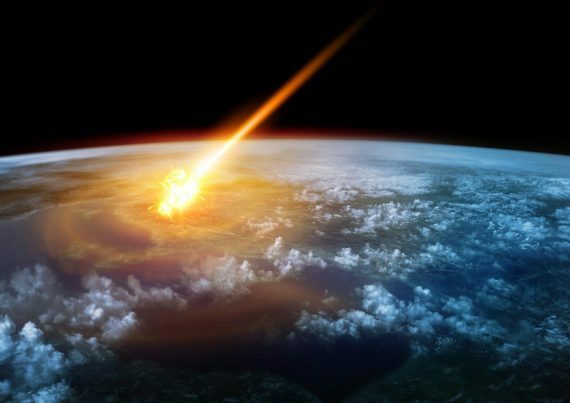 About six years ago, a research funded by the National Aeronautics and Space Administration (NASA) found evidence that some building blocks of DNA found in meteorites were likely created in space. This research gave support to the theory that a “kit” of ready-made parts created in space and delivered to Earth by meteorite and comet impacts assisted the origin of life. “People have been discovering components of DNA in meteorites since the 1960’s, but researchers were unsure whether they were really created in space or if instead they came from contamination by terrestrial life,” study’s lead author Michael Callahan of NASA’s Goddard Space Flight Center said in the NASA report. Callahan said that it was the first time that three lines of evidence were discovered which gave them confidence that these DNA building blocks were actually created in space. Read more news about scientific discoveries at FutureScienceNews.com.